This may at first blush seem like a milling card, but unless Szadek, Lord of Secrets is wielding it or you're up against lifegain.dec, your opponent is going to lose to the damage the Blade-wielder is dealing far sooner than he loses to an empty library. Not that that's a bad thing, mind you. But given the highly variable bonus Trepanation Blade gives to a wielder's power, coupled with its relatively high casting and equip costs, I'm sorely tempted to believe that there's better, more effective Equipment for you to choose from. If we assume that the average person's deck has about a 2-to-1 nonland to land ratio, Trepanation Blade will, on average, grant its wielder +3/+0. And put a few cards from their deck into their graveyard. Now, for a randomized library, the odds of milling away their good cards are balanced out by the odds of milling away cards that are useless in the current situation, digging them towards better cards. So that issue is a wash-- we're neither improving nor ruining their draws. But in Innistrad, there's plenty of flashback cards, plenty of reanimation spells, and plenty of cards that are improved by having a full graveyard, so there's a chance that the stuff you're dumping into their graveyard is actually more useful to them there than it is in their library. Whispersilk Cloak will usually end up increasing your damage output by at least as much, if not far more, for the same mana investment, and won't accidentally give them cards they can use. As you may be aware, trepanation is the practice of drilling a hole in a person's head for medical purposes. 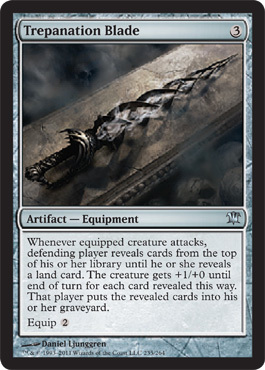 I'm not sure that's what the sword shown on this card was ever intended for, but you do need to be careful you don't intentionally help the opponent by "turning on" their flashback cards or their reanimation strategy. Still, against most "normal" decks, this can cause some pretty ridiculous power boosts, and get rid of potential threats at the same time. Try it with Invisible Stalker! Today's card of the day is Trepanation Blade which at three mana to cast and two to equip is about average for equipments in cost, though it has a fairly random impact on games as it can be as low as one card milled and +1/+0. The potential is high which may have it see play in a combo that promotes damage dealing for library destruction, but is not reliable enough for decks that are along the more standard designs as one of the Swords can do more for the same cost. For Limited this is playable and potentially strong as the smaller decks and value of equipment in the format both help to make it more valuable. Any Sealed build should be able to fit this in as a colorless source of damage, though it doesn't add anything to protect the target, and Booster can draft this early in weaker packs or when unsure of the final color scheme of the deck.